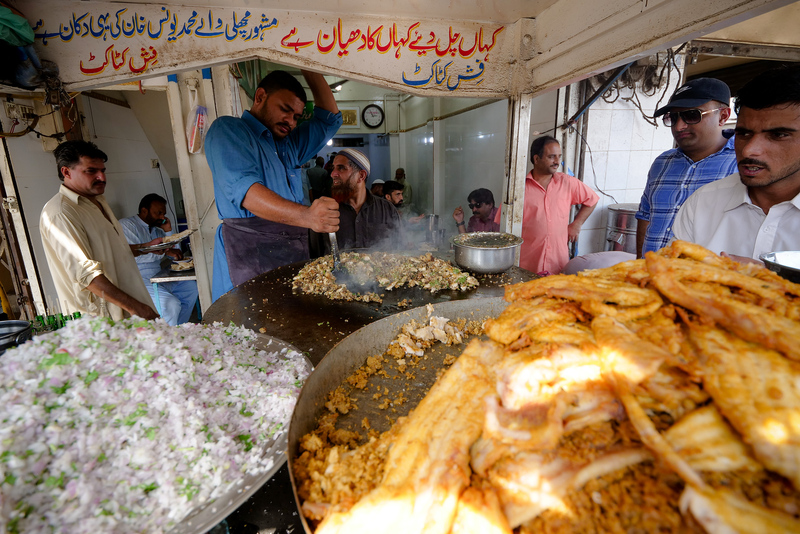 Karachi street food ranks near the very top of my list of all the reasons why I’d recommend someone to visit Pakistan. There are so many incredible things to eat, exploring every option could easily take a lifetime. Being such a vibrant place, I love how in Karachi you can find both those comforting tastes you’re hungry for, while also finding ingenuity among those traditions as well. 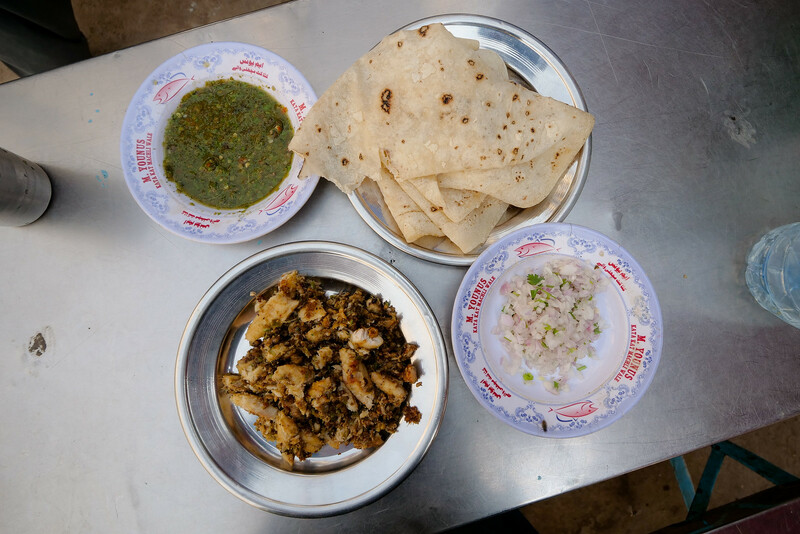 Masha Allah is a great restaurant in Karachi, faithfully serving customers their version of ‘kata-kat‘ chopped meat – in this article I will share all the details with you. 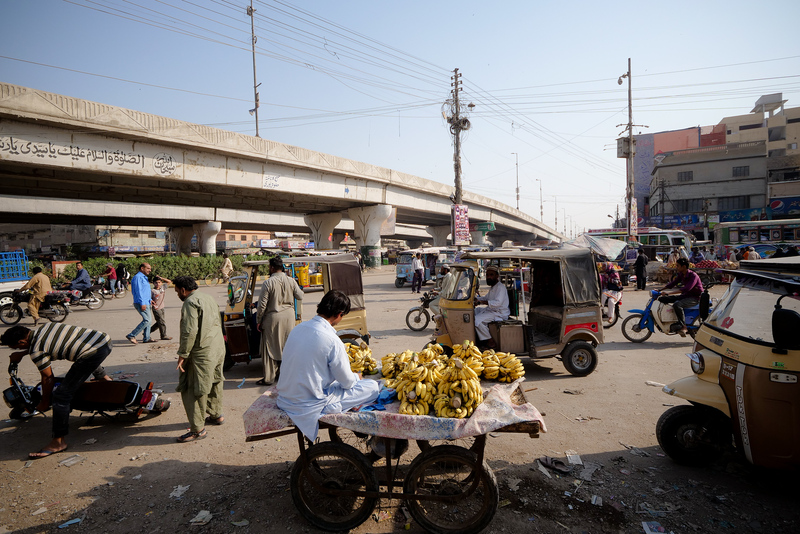 Few places but Karachi can say ‘Street Food’ any better than this scene here. What’s more important though, is that kata-kat traditionally (famously*) makes use of only leftover parts – those bits of meat that are not really needed for any other recipe (but can also easily be just as tasty). At Masha Allah, using fish filets for their recipe instead of cow or goat parts, provides a wonderfully unique set of flavor possibilities. This was so incredibly tasty that we didn’t actually take time to search out the original, so, while I can’t comment personally, I can definitely say that its food you should visit Karachi just to try. If you haven’t seen the video yet, you can use this link here (YouTube), it will jump to the section where we visit the Masha Allah Restaurant. *Note: The more well-known version of kata-kat is full of offal – usually brains, testicles, and heart, of either cow or goat. Making your own kata-kat at home might only require a frying pan. However – when you’re wanting to serve a room so full of customers that even the seating is standing-room-only, you may need something a bit larger. The restaurant itself is a small, elevated, almost bunker-like room, and it lies hidden behind their cooking-cart, one that is still in service since fish kata-kat’s first creation. A 1.5 meter-wide giant of a griddle fills almost the entire entrance to the restaurant. Sitting directly on top of the food cart, a four-wheeled wooden pedestal for all to see, its fun to watch the chef whipping up one plate after another of chopped fish delight. Ordering a plate of fish isn’t difficult, but you may have to be ready to bump a few elbows. The chef is cooking almost constantly, choosing fish filets off of a mound of fish that’s been sort of built onto the side of the hot-plate itself. The fish are being fried first in an inner kitchen, and then moved out to restock the chef in front who is the one actually making them into your meal. He never quite finishes a batch of fish before he’s already knocking over another dozen filets onto the sizzler. Its a smooth rotation of splashes of oil, sifting huge handfuls of red onions, garlic, and cilantro across the hot plate, and then seeding all of it with thoroughly precise unmeasured handfuls of dry masala spices. Chopping and mincing the pre-fried fish with all those seasonings is what makes the signature ‘kata-kat’ sound, but the front chef is not so much cooking the fish as he is re-heating, and mixing it. It looks a bit oily, but of course there’s no way you’d ever want this dish without that double-flavoring. The second time on the pan adds just huge amounts of additional fried flavors. I guarantee that watching the chef for just a minute, you will find yourself nearly uncontrollably hungry. But whatever you do, as you’re searching out a place to sit, please don’t forget the chutney. The chef hands you your plate of fish kata-kat just seconds after he scrapes it away from the hot iron griddle. I’m going to go ahead and tell you that reserving a dish of chutney is even more important than reserving yourself a place to sit down. The bread item accompanying this meal will be chapati, but you don’t have to wait in line for this, as they will bring this to you. 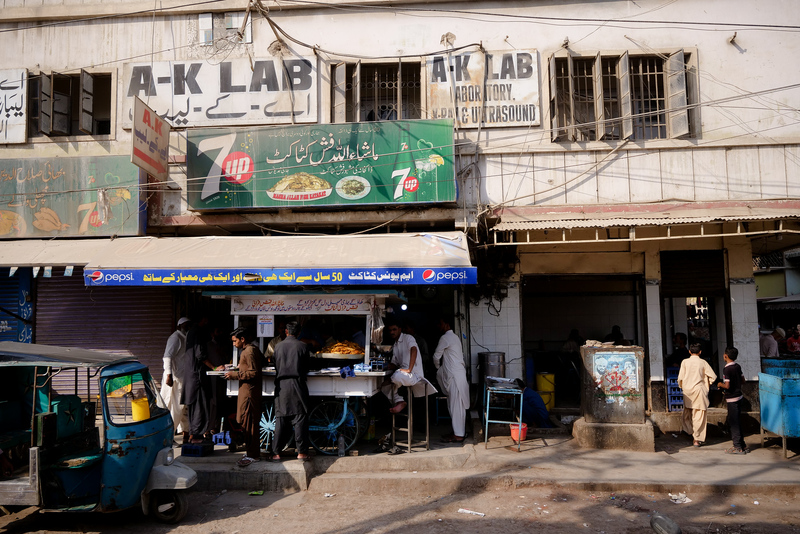 As with most popular street-side restaurants in Pakistan, there is a dedicated line of fresh tandoori oven or griddle masters working next-door. The bread is finished, and waiting staff come walking through the eating area to keep the customers supplied with a never-ending flow of still-steaming breads. The simple yet unique style of cooking here just blows me away. Its great to watch, to see how they just perfect this meal of street food, and then by the time the food arrives, they’ve literally built your excitement up to perfectly sky-high heights. So you have a plate of fish kata-kat, the deep green mint chutney, and you’ve just been awarded your piping hot chapati bread. All is temporarily good in the world. 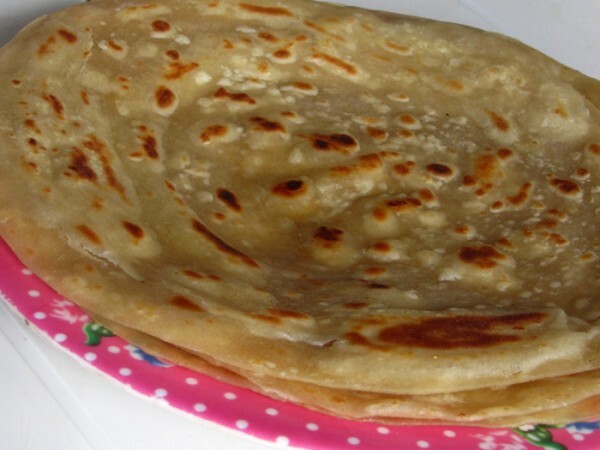 Tear off a good-sized handful of that chapati, and dig into just the first for your first big bite. The fish is incredible, not too oily at all despite it taking at least a cup of oil to cook all half-dozen of the fish in each batch. 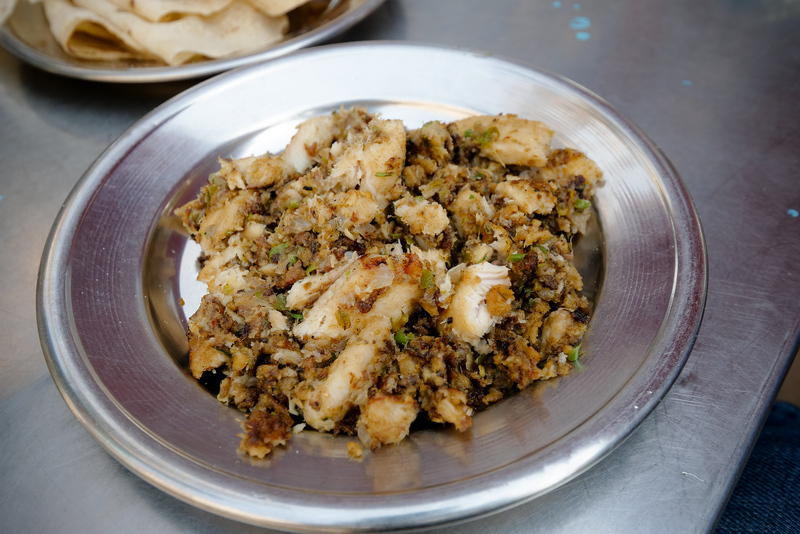 It is peppery, full of masala dry flavor, but then so juicy inside as the chef lets it fry just long enough for the whole fish to cook. For the second bite, prepare for exultation of every taste bud you have. Dip up as much of that sour and minty chutney as you can, and bon appetite. Just thinking of it now makes me dearly want to rejoin my friends on another Karachi street food pilgrimage. Not only was this one of the best meals of our entire Pakistan trip, but we got to eat at a table right next to the owner and originator of this recipe himself! After taking a few photos together, he insisted on us having another plate of fish, several more plates of the chutney, and then insisting on giving us the entire meal as complimentary. Yet another day full of ridiculously delicious food, and even more heart-warming experiences with the wonderful Pakistani people. I absolutely loved our trip to Pakistan, and if you haven’t done so yet, you can check out more of my Pakistan food and travel blogs. I remember there was a popular game my friends were playing on the iPhone a few years ago, something called Fruit Ninja. This amazing man wielding what looked to be just an unguarded saw blade was chopping up vegetables without a cutting board, easily twice as fast as I have ever seen a vegetable chopped before. With a whir of motion he went through entire cucumbers, tomatoes, fresh beets, water loofah, and carrots. He was creating about 10 plates worth of vegetable salad items in literally under 60 seconds. After enough gracious repetitions where he allowed us to get close up video footage, we asked for a plate of the fresh salad for ourselves – just look how beautiful he arranges it too. 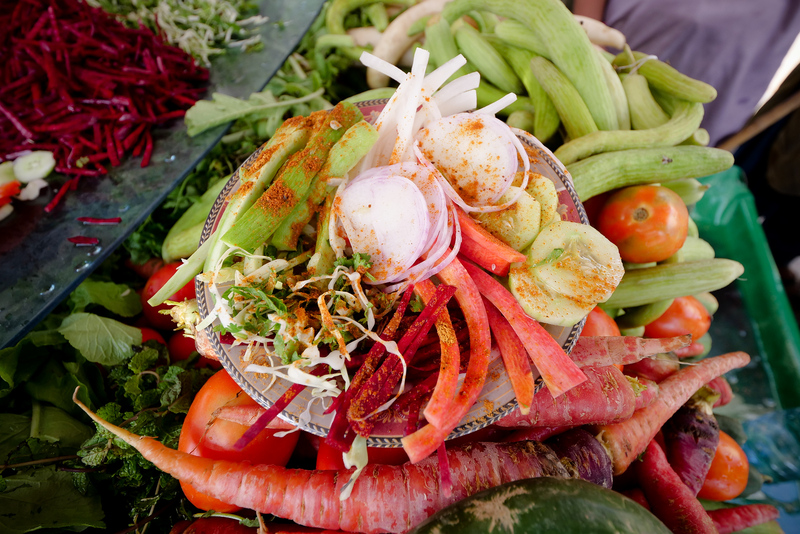 He was only charging 30PKR (about US$0.22) per plate, and he not only makes it into a salad for you, but he also squeezes over it some fresh lime, and then shakes on some wonderfully seasoned masala spices as well. Now that’s a hand-chopped salad. The Pakistani salad ninja sells his salad right outside Masha Allah Fish Fish Kata-kat on the sidewalk. 35 comments. I'd love to hear from you! LIAQATABAD”s famouse fish katakat, that was an awesome experience and still I’ve taste in my tongue. You are most welcome Pooja! Have a great day! Thank you for your support Shri Krishnan, take care, and have a great day! Pakistan’s street food you share quite attractive. I really want to enjoy these dishes. Hi Deva! Thanks for the support! Thank you Hasan, and thanks for the recommendation. We would absolutely love to visit Quetta! Hello, and thank you for your invitation. Isfahan must be food of incredible food as well Im sure! This is all looks so incredible, I can’t wait to eventually try it! Thanks Crativ, and I hope you get the chance very soon! Take care. Good Job , you are given us best information ..
You are most welcome Gayatri! Have a wonderful day today! Hope you are doing great with Pakistani Food, Am I right Joel? LOL. And Yeah, I have to tell you this that whatever food you posted in this blog, really which made me hungry. And especially, the title you have given for fish and chutney is really amazing. I think that will be coming from heaven only. Dipti! Thank you so much! Getting messages like this not only is useful for the website, its also personally motivational – which is very important – so thank you so much for taking the time to write! We have enjoyed making this content, just as we heartily enjoyed experiencing it while in Pakistan. An amazing trip, one we will never forget. Thanks for you support, and have a wonderful day! looks delicious bro! I have been watching your videos recently i watched your pakistan tour which is great. Chirag, thanks so much for the support! Have a great day today. Thank you very much for the support Em! Have a great day today. I’ve never seriously considered visiting Pakistan, but I’ll admit that this post, plus all of the great videos have me thinking this might be worth a trip someday. Everyone you encountered appeared so genuine and hospitable. I give you kudos for taking this trip and sharing the food of Pakistan with so many people around the world. OMG these photos are making my mouth water. I have not been to Karachi. How long did you stay in Pakistan in total? Going for all those leftover parts is integral in a lot of the cooking. A lot of the Muslim Indian cuisine is so similar but I’m sure all the regional and changes over the years in Pakistan would make it such a culinarily amazing trip! I’m not quite as adventurous of a foodie as you are, but this all looks so good. I think street food is some of the best food you can get when traveling. It’s almost always inexpensive and you’ll find lots of local favorites. Just discovered your blog, can’t wait to read more. Hi Eden, thanks very much for reading! Street food usually has the most possibilities, and we both find that street food allows you to meet some really great people as well. Always good for the most beautiful memories of any trip. Have a great day, thanks for the supprt! Mark, you need a full day if you want to taste the variety of breakfast in Lahore. There is a place in Lahore where you have an opportunity to enjoy 22 different breakfast options there, however, you have tasted a few ones before in your previous tour. Hi Khurram, thanks for reading! We enjoyed our 3 full days of eating in Lahore, and were still a bit sad to leave. That is an amazing city, hopefully we will be back again soon. Have a great day today, thanks for reading. Although, we live in Pakistan but could not explain it in front of our friends in such a wonderful way. Salute to you Marka and your writer! By the way, it is just a tip of an iceberg. The whole country is full of ridiculously delicious food especially Lahore and Karachi. “What a delicious post!” is the least I can say 🙂 I remember having Chutney or something similar in a food festival in Berlin. To be honest, I think that it was improvised: it had to meet the criteria of the local population. No matter what, eating traditional Pakistani food is an experience by itself. 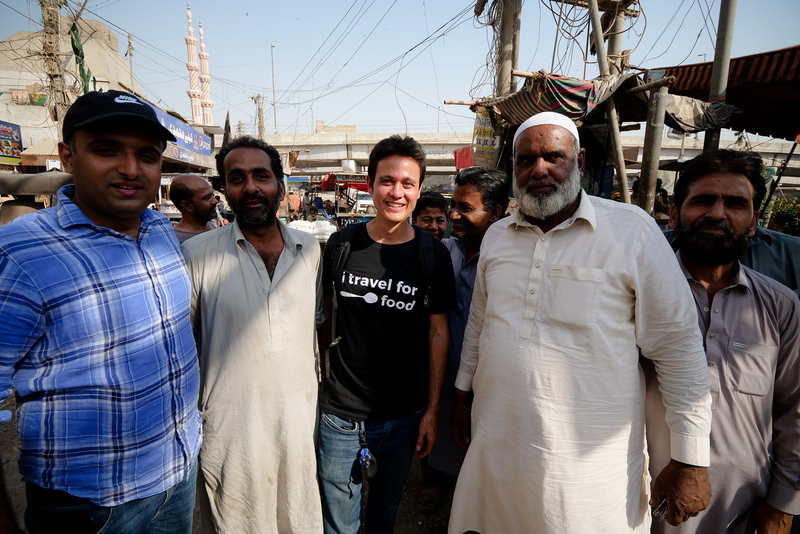 I hope I can make it one day to Pakistan -I guess I will roam the streets like crazy in search for street food!